Most useful for when you are not at your own PC. A very good java-applet IRC client - support all the /server type switch I am aware of. Personally I use the demo on their site and then use commands to connect to the server I am really interested in. Dynamically modify webpage layout (and content) using Platypus! with a WYSIWYG interface. Platypus! uses GreaseMonkey to do it's thing, so you'll need that. I use it to overcome those annoying width restrictions on page layout! I hate increasing the text size only to find it's being squashed way before reaching the limits of the screen! High Resolution Wallpapers, pretty too! The universal Infrared Control Engine, and it really is! It works with the remote control for my TV card, even when the TV card and it's drivers are not installed! Girder remote control and automation tool. While I've never gotten this to support my remote control directly, it does support many other things, such as joysticks as controls, and perhaps much more importantly allows you to control just about anything in windows. I use this to map the external numpad my Gamer's Keyboard has to function such as turning the screen on and off, changing winamp's volume and inverting my screen colours. Software and tools I consider essential, and install instantly upon a rebuild. For useful tricks when rebuilding a PC, see Tools. Firefox's sister project, Thunderbird, is an open-source email client of a similar standard to Firefox — it has all the functionality you'd expect (akin to Outlook (Express) et al) but is less annoying. This is the “portable” edition, which runs directly off of a disc (or more likely, a USB drive). Got some spare space on your USB-drive based MP3 player? Then you can carry your email around with you - very handy if you want to synchronise your email between work/home or just laptop/desktop. I'm personally using the otherwise-useless 32MB Compacy Flash card which came with my digital camera for the task, it's really quite convenient! Another extension for FF, with this you hold the right mouse button and draw symbols (it draws a red line while you hold the button) and when you let go does a specific action based on the symbol. If you've played the game “Black and White” this ought to be familiar to you.
! !If you've had to re-install windows (not merely repair it) then this may be just what you're looking for to easy the transition!! This basically adds symbolic links (aka “soft links”) to windows. They were already there, but not readily taskable to users. If you've reinstalled windows you might note that all your Documents & Settings directories have new names, such as “All Users” becoming “All Users.WINDOWS” in my case. I recommend you do what I did - move all the files to the new (nasty) names, and then create soft links to the old name, so you don't have to update all your software. Most of my stuff just runs from Program Files now ;) yay. All-in-one Instant Messenger client - MSN, ICQ, AOL, Yahoo, IRC, Jabber (including GoogleTalk), Rendevous and probably others. See the skin for it below. Wonderfully useful multiplatform file synchronisation system, I use it to sync this site between my webserver, desktop and laptop regularly, as well as to sync my email betwen my PCs and more. I use this baby a lot! Adds an interactive calander (with scheduler), todo list and event list to the desktop. Amending your todo list has never been this easy, and it looks great! This tool allows you to tweak all the colours in Windows 9x/NT/XP, and it also allows you to switch schemes instantly. Included is the night-time and day-time schemes I switch between almost daily. This link is for an archive I'm hosting myself, it contains everything you need to do hack an “install” of it (files + registry fragment), I personally install it this way since the offical site went down. A text-editor for Windows so good that I paid for my copy. It's aimed at coders and other who might find use for regexp Find & Replace dialogs and similar. Use the GMail webmail interface as your default email composer, instead of launching an unwanted application (such as Outlook (Express)). Scans discs and checks for CRC32 errors, also can attempt recovery of a disc. Wonderfully thorough and well-crafted DVD Info utility, does what Nero Info Tool does, plus scan for CRC32 errors, perform PI/PIF/Jitter scans, speed tests, and can read disc manufacuter codes. A windows clock augmentation, it allows complete control over how and what is displayed in that area (not strictly limited to date and time!) and has a very nifty pop-up calander, although if you use the calander a lot consider RainLender which is also in this list! Very nice little utility for monitoring misc. motherboard settings, such as temperature of the CPU, Fan RPMs and the like. If Motherboard Monitor doesn't seem to work on your setup, give SpeedFan a try. It works with my Acer TravelMate C312XMi tablet PC, showing me the harddisk temperature and two other temperatures I presume are either CPU or something quite mysterious. More compact that MBM5 (see above) and simpler than SpeedFan, this also has the ability to fetch the GPU and Ambient temperatures from various graphics adaptors! The best (freeware) tool I have found for fixing gamma (and hence colour) problems on my screens. Does a pretty good job of making my very dark, dying, screen usable again. Calculated CRC32, SHA1, MD5SUM and many other hashes from text strings or files. Handy for checking downloads. The windows gizmo, a very useful little tool which lets you turn your screens on and off. I use it for scripting via my remote control. A truly drool-worthy keyboard concept - each key is a colour back-lit LCD screen. AudioScrobbler provide plugins for all usable music players which generate statistics on what music you listen to, and display these on their website along with 'neighbours' who share your taste. Last.FM allows you to use this information to create a personalised radio station, playing music you listened to anyways, along with music which statistically you ought to like. I use this whenever I have the bandwidth and it's awesome, I've been introduced to some new bands thanks to this! Making light of those crappy posters you see that have a pretty picture and a cliched slogan like “There is no I in team-work”. I have the Motivation one pinned above my desk at work. VIM Syntax for Standard C and others. Websites which I recommend and frequently use. Very good source of torrents for the TV episodes, as well as a good source for episode titles (as used by my renaming script). (Formally TVtome.com) A great source of info on TV series, especially episode titles (as used by my renaming script). I thought I'd write a bit about some of the more interesting things I link to. Microscopic Pro is a skin for trillian. It's really quite tiny, but is not lacking in usability. Far Left: The contact list, with icons showing which medium they use. The individual avatars of friends can be viewed in a large tooltip which appears when you hover the mouse over a name, also it appears in a corner during conversations. Those that are “away” or similar are in a colour similar to the background, and hence harder to read. Left: This shows what windows are available (visible and hidden). Below: A conversation window. The grey text is the history of our last conversation. 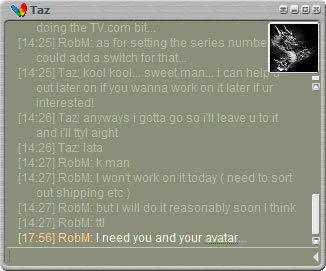 If they responded they name would appear in blue and their text in white (see IRC conversation below). Above: An IRC window. Note the horizontal rule showing where the window last lost the focus - this serves as a visual aid to find what you last read before switching to another task. Below: Another IRC window. This is the expanded layout - this is also available for normal conversations, but without the IRC Topic ticker along the top. Not sure if I am allowed to put this up here, but the author's site seems to have issues.